The very first review I ever wrote was for Mystic River. It wasn’t very long, very good, or posted anywhere, but it was the first step I took to becoming a film critic, so for that I’ll always remember this film. It was an Academy Award nominee for Best Picture in 2003, nominated for Best Director, Best Supporting Actress, and Best Adapted Screenplay as well. It won Oscars for Best Actor (Sean Penn) and Best Supporting Actor (Tim Robbins), so this is a movie with history for a lot of people, not just for me. It’s also the first movie to be crafted from a Dennis Lehane book. Many others would follow to some degree of success or another: Gone Baby Gone, Shutter Island, The Drop, and soon The Deep Blue Good-by and Live by Night. So Mystic River is not just another crime film, it’s an Oscar-worthy picture directed by a legend, a living piece of literature, and a movie that will always remind me of humble beginnings. Three best friends from Boston are both connected and broken apart by a tragic event in their childhoods that will follow them throughout their adult lives. Jimmy, Sean, & Dave are just regular neighborhood kids who enjoy stickball and petty crime until the day Dave is kidnapped by men posing as police officers, an event that none of the three will ever forget. All grown up now, Jimmy is a local crimeboss turned shopowner, Sean is a cop himself, and Dave is a husband & father with serious psychological problems. So when Jimmy’s daughter is senselessly murdered one early morning, Sean heads the case in his old stomping grounds, asking Jimmy the tough questions and wondering why Dave’s wife seems afraid of her own husband. The answers won’t be pleasant, not in a town run by crime, fear, and the way of the gun. Mystic River is one of those very few movies that appeals to all audiences. It’s based on a well-written, high-motor crime novel set in one of America’s favorite cities, laced with old grudges, seedy characters, and false trails. But it’s also supported by quality music, great direction, and acting performances that you’ll have to see to believe. It’s a page-turner that never loses its depth, always exciting & intriguing in equal quantities. Sean Penn blows his role away, the grieving father who will stop at nothing for justice. Tim Robbins is perfect as the unstable Dave, a man who never really escaped his captivity. And even Kevin Bacon was strong, though he gets less love. Rounding out the cast are Laurence Fishburne and Marcia Gay Harden, two excellent supporting actors who make the most out of every scene. The film is dark, gritty, totally Boston, chock full of the fictional crime history we just eat up, and layered so as to keep our collective interest piqued until the unbelievable climax. 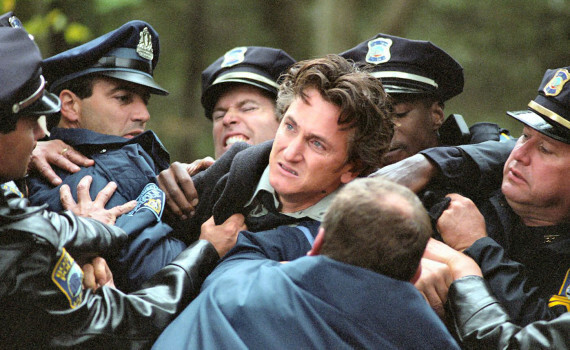 A few bad accents short of perfection, Mystic River is the very definition of a must-see.